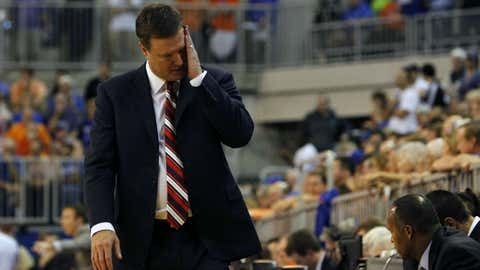 Bill Self and the Jayhawks still have a long way to go to reach their full potential. It’s too early to push the panic button, but it’s not too early to pull out the manual and see where the damned thing sits on the console. Reports surfaced that the Kansas Jayhawks, losers of three of their last four, held the dreaded players-only meeting Wednesday. Jock tradition says this is where air gets cleared, names get called, fingers get pointed, grudges get amplified and lines get drawn. Only with this team, one instead imagines long stretches of silence, interwoven with marathon sessions of "Call of Duty." Hell, maybe pizza. We hope we’re wrong, of course. But the fact remains that the 6-3 Jayhawks are, at present, an F-22 Raptor — agile, fast, spectacularly mocking the laws of gravity — that seems to be flying without any kind of pilot. When the going gets tough, the response has too often been a blank stare. Andrew Wiggins is a lot of adjectives, but "rah-rah" is not one of them. Compared to Wiggins and frontcourt mate Perry Ellis, mimes look positively chatty. And the cruelest irony of the last three weeks for coach Bill Self is this: The more comfortable Wiggins seems to look at the college level, in all phases of the game (offense, shooting, defense, passing), the more wallflowery his teammates have become. Especially on the defensive end. You know, regardless (of) how anybody else thinks going into (the season), we knew and they knew that there were going to be some things that we were going to go through. The thing that’s disappointed us is, we know we can play better. As much as the Jayhawks’ outside shooting has elicited painful looks, their inability to register big stops — or even consistent stops — is also trending on the wrong side of Self’s otherwise superlative history. After nine games, the database site Sports-Reference.com rates KU as the (deep breath) 99th-best defensive team in the country out of 351; the Jayhawks are allowing 98.2 points per 100 possessions. Each of those numbers is, by far, the worst mark by a Self team, and by a significant margin, over the five seasons in which these particular stats have been tracked. Last winter, KU ranked 15th (89.9 points per 100 — the lower the number, the better) in the nation; the year before that, 16th (91.3). In the four previous seasons prior to this one for which the ratings were kept, the Jayhawks surrendered an average of 91.38 points per 100 possessions while posting an average defensive rank of 15th in the country. The names and faces would change, but you could always count on a Self team to be a stinking beast to try and score against. Suddenly, up is down, and the lions are lambs. Jeff Withey, we figured. But who knew that Kansas would miss the pesky (and steady) hands of Elijah Johnson and Travis Releford as much, if not more? "I don’t think our guard play has been very consistent so far," Self told the Topeka (Kan.) Capital-Journal this week. So how do you fix it? Self has thrown the gauntlet down at the feet of his point guard (again), saying Thursday that "for us to have a really good year this year, Naadir (Tharpe) has got to step up. There’s no other way around it." While Wiggins’ defensive awareness has improved, it’s clear that he needs help on the wing, too. Going into this weekend’s tilt with New Mexico at Sprint Center, KU ranked 211th in Division I in opponents’ 3-point shooting percentage (35.1) and 232nd in opponent treys made per game (6.8). KU was No. 1 in the country going into their final game of last March in terms of lowest effective field-goal percentage by their opponents. As of Thursday, the Baby Jays rank No. 107 in the nation in that category. And KU ranks 170th in most second-half points allowed per game (37.9). So, summing up: Self’s Jayhawks aren’t finishing games on defense, and they’re watching teams take and make threes at an unhealthy rate. Encouraging trends, they ain’t. Members of the Kansas Jayhawks team sit on the bench in the second half against the Colorado Buffaloes at the Coors Events Center. The Buffaloes won 75-72. The folks in Lawrence are used to filling up bandwagons, not having to circle them. Self contends that freshman guard Wayne Selden is a safer defensive option, despite a slump that’s seen him average just 6.8 points and three turnovers over the last four contests, than Conner Frankamp or Brannen Greene. Sports-Reference.com doesn’t agree, though, rating Frankamp’s defense (an estimated 101.5 points allowed in 100 possessions) as superior to Selden (105.1 in 100), Tharpe (104.6) and point guard Frank Mason (102.2). This year, S-R com has tagged seven different Jayhawks with defensive ratings at 100 or higher. Last season, S-R.com rated only one Jayhawk as allowing more than 100 points per 100 possessions — the coach’s son, Tyler Self (101). Among last year’s backcourt, Tharpe had the most accommodating rating (97.0), followed by Johnson (95.8), Releford (95.6) and Ben McLemore (93.3). "You know, regardless (of) how anybody else thinks going into (the season), we knew and they knew that there were going to be some things that we were going to go through," Self said earlier this week. "The thing that’s disappointed us is, we know we can play better." If the Jayhawks want to avoid falling out of the Top 25, they’ll have to. With the Lobos (RPI rank: 17) and Georgetown (49) up next and San Diego State (15) on tap early next month, if someone doesn’t take the stick, this jet could start to nose-dive in an awful hurry.